About: The Lamb & Flag is the oldest pub in Covent Garden, a truly traditional British pub with low beams, wooden panelling and bare pine floors. Its smoke filled bar becomes extremely busy, but there is a restaurant and another bar upstairs which deals quite well with the overflow. It caters especially for whisky lovers. Bar food and a selection of beers are also served. They also have a live Jazz band every Sunday between 7.30pm and 10.30pm. Outside seating is provided in the garden. The Lamb and Flag has so much tradition that we’re only telling you that it was a favourite of Charles Dickens’ as an extra special treat. With its wooden paneling, ornamental brass, leaded windows, leather buttoned booths and oversized lamp posted above the entrance, this is classic British pub decadence in the heart of Covent Garden. Once known as the ‘Bucket of Blood’ on account of the bare-knuckle fights it once hosted, this ancient Covent Garden pub is without doubt one of the oldest in the West End. Dating back to Tudor times, it later became a favourite of Charles Dickens. 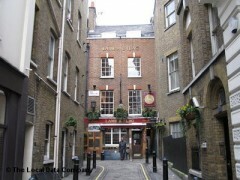 We went to the Lamb and Flag for a quick drink before heading to St Christophers Place for dinner. It's a traditional pub that does what it says on the tin, but suited us just fine. Service was friendly and the place was clean. Always a favourite with myself and my friends until an incident the other evening with particularly rude bar staff who had no interest in serving and every interest in clearing the bar early. Hopefully the management will wise up to the present quality of the staff soon. Until then, we'll spend our hard earned money in a place that appreciates and respects it's customers. Great pub. I was there Sunday night with some friends. Downstairs looked a bit bare as there was not many people there. However, upstairs was a different matter. It was hopping. Live jazz is played every Sunday evening. And they are really good musicians. Mary, the singer, is outstanding. Of course, it was a bit difficult to get served at the bar with the heaving crowd. Nonetheless, I'll definately be going back again.